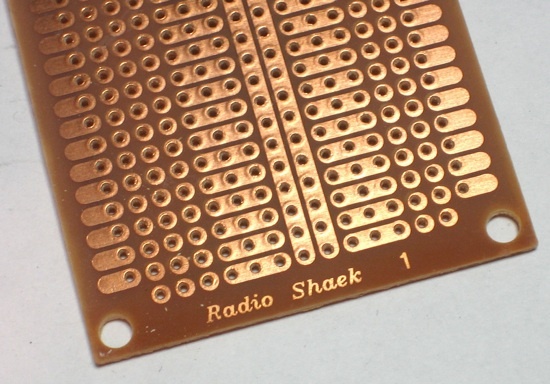 RadioShaek « Adafruit Industries – Makers, hackers, artists, designers and engineers! Rather a crude knockoff. Hope the missing row of pads doesn’t inconvenience anyone! But then I guess I’m not very observant, the original has a two hole row on one side as well. What I was noticing is what looks like the board integrity being kind of broken up under the copper where the drill bit punched through. I’ve had to deal with this before and the copper can kind of peel off the board because it’s been separated. Nothing like having those round copper pads pop up when you heat them. doesn’t anyone make a plated through hole board? Might be worth the $3. If nothing else, the RS boards look like a throwback to 1970’s single sided circuit boards found in so many consumer grade electronics I saw when I was growing up. This company (Measure Explorer) sells via their e-bay storefront, but the product is quality construction. I got out a loupe to check their work on the boards I purchased. They compare to the “Radio Shaek” boards as a Mercedes would compare to a Model-T. They also claim to be looking for US distributors. Single side, double side, double side with plated holes, double side with plated holes and cuttable traces. Round pads, square smt friendly pads, they seem to have the gamut. They are also made to be stackable using hex standoffs and screws.